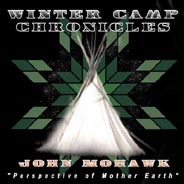 The WinterCamp Chronicles Radio Page is for Independent, Public and Community Producers, Program Directors and Stations who can use Sound Bytes of Native American Voices throughout their program schedule. 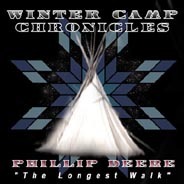 There is also a link to the WinterCamp Chronicles: NDN Voices of Our Times (Radio Program) in MP3, which is a sample mix of sound bytes. Provided directly below are program promos for that program, which all you need to do is add the times of broadcast. Below each speakers section there are Links to Podcast promos in 90, 60 & 30 second versions. 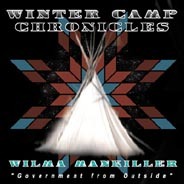 Please feel free to download these and follow the WinterCamp Chronicles "Quotes" airplay with a podcast promo for convenient identification of the sound byte. The WinterCamp Chronicles is a demonstration initiative for evolving Native American Oral Traditions in modern times into state of the Art, Cutting Edge Technologies from the foundation of Spoken Word and through Independent Native Radio. These voices return from those days they were spoken to the Digital Age of the new millineum via online, broadcast and portable media channels. As the late Phillip Deere said, "They World Now Knows!" Thank you for your interest in the WinterCamp Chronicles. Please help these voices carry forth their vital messages for everyone in these times. Run these sound bytes as Standalone "Quotes", create your own mix version and run that or, mix them into other programs where they fit. We also encourage everyone to also transfer these voices to portable media (CDs & MP3 players) to further their reach. In closing, we Thank You again for your support of the WinterCamp Chronicles and we hope only that everyone gain as much from these voices as we have since we recorded them so many years ago. listen to or DOWNLOAD "I made a commitment"
listen to or DOWNLOAD "The Cry of the Red Man"
listen to or DOWNLOAD "The World Now Knows"
listen to or DOWNLOAD "Where Mr. Indian Stands"
listen to or DOWNLOAD "Know Both Ways of Life"
listen to or DOWNLOAD "Grandma Is Still Out There"
listen to or DOWNLOAD "We Are Who We Are"
listen to or DOWNLOAD "A Human Being Way of Life"
listen to or DOWNLOAD "Go Down Stream"
listen to or DOWNLOAD "How Much We've Lost"
listen to or DOWNLOAD "Be Thankful"
listen to or DOWNLOAD "First Law, Water"
listen to or DOWNLOAD "Not Long Ago"
listen to or DOWNLOAD "Peace"
listen to or DOWNLOAD "We're The Ones"
listen to or DOWNLOAD "Seventh Generation"
listen to or DOWNLOAD "Common Cause"
listen to or DOWNLOAD "Tribal Self Government"
listen to or DOWNLOAD "Cherokee Nation / Cherokee people"
listen to or DOWNLOAD "How I Got Involved"
listen to or DOWNLOAD "We Survive"
listen to or DOWNLOAD "Revitalize The Cherokee Nation"
listen to or DOWNLOAD "State of the World"
listen to or DOWNLOAD "Transformation"
listen to or DOWNLOAD "Power Over Nature"
listen to or DOWNLOAD "Re-Transformation"
listen to or DOWNLOAD "Re-Think Anthropocentrism"
listen to or DOWNLOAD "Story Of The Twins"
listen to or DOWNLOAD "Who Are We?" WinterCamp Chronicles: NDN Voices of Our Times (Radio Program) in MP3 Now! David Campbell: From his Pretty Brown album (MP3) - "Grandfathers"